Although I have not posted in almost a year, I have come to find out the site is still referenced and enjoyed by many. Since that time, additional Mystery Ships have been identified and several misidentifications have been corrected. Please check back in the near future for updates, corrections and maybe even a new picture or two! If the last name ends in Boy, I am stumped, as I do not have a picture of the old Sand Boy which was scrapped in the early 60's, or at least left the lakes by then. That's the only Boy that comes to mind. If it ends in Bay, there were several Bays in operation back when this shot was taken and even some Bays are sailing now. I can sure say what Bays it's not, better than what Bay it might be! My guess, by process of elimination , would be the photo was of the old Heron Bay (1). Even Heron Bay (2) has since been scrapped, but I will say Heron Bay (1) and let others make their comments known. This from the looks of it is the "Back Bay" of the Gartland steamship lines. Which explains the "S" on the smokestack. Just like the Nicolet in the early 60s she wore an S on her stack as well. This would have been taken between 1923 and 1942. She carried this name on the lakes during that time and went off the lakes to serve the war effort. 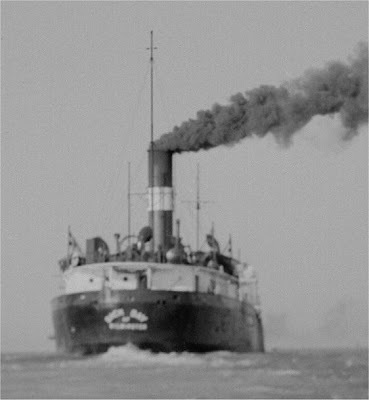 She returned in 1950, was returned to the maritime administration and eventually was laid up in the James River lay up fleet and scrapped in 1950.